It was still dark when my Austrian Airlines flight landed in Vienna. At five in the morning, the airport was almost empty, and it only took 15 minutes to cross immigration and get my bags. A car was waiting for me, and after a short ride I was at my hotel. Austrian Airlines was not too bad. While they lack the frills of, say, Singapore Air (no amenity kits and priority luggage scan for business class, etc. ), the food and service overall was good. Most importantly, they had the shortest route to Vienna from Mumbai! 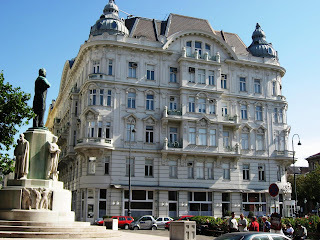 The Hilton at Stadtpark is a nice hotel with an excellent location, a fairly good restaurant, and well-appointed rooms. 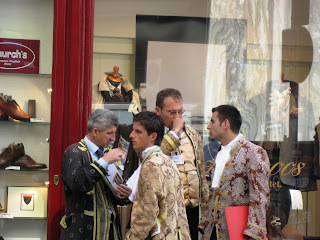 After a hearty breakfast, I strolled out into the streets of the First District. 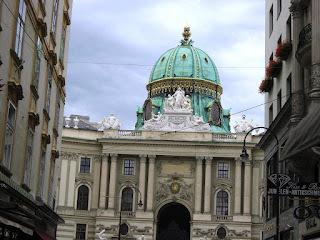 Like London, much of Vienna’s history is written in its buildings. Old churches, palaces, mansions, and even office buildings convey a great deal about its rich history. 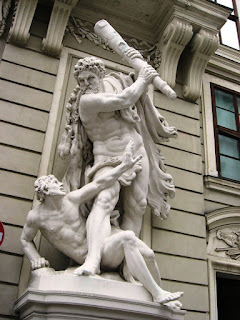 Vienna’s long history has been primarily influenced by the Hapsburg dynasty which ruled from here for over six hundred years. 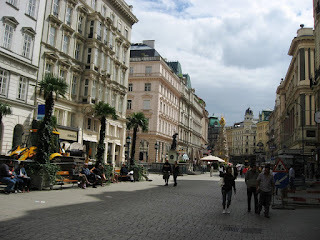 I walked the narrow cobblestoned streets, clearly built during the medieval times, stopping to admire the frescos and elaborate facades on the old Baroque buildings that lined these roads. As the morning progressed, other tourist began pouring in too – mostly European, but also some American and Middle Eastern. 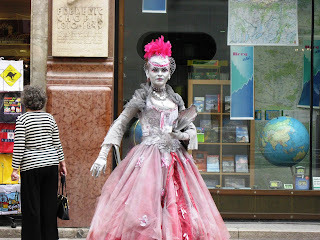 From what I could see, hair in shocking pink, orange or red seems to be very much in vogue among European girls! 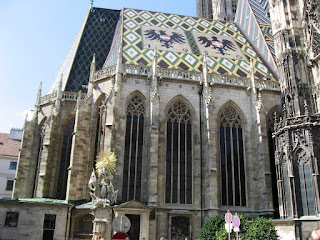 I emerged into Stephansplatz where the majestic St. Stephen’s Cathedral rose into the sky. 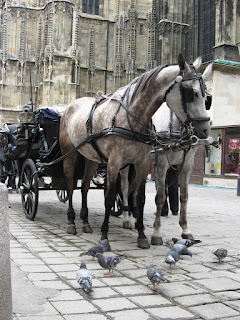 This is probably Vienna’s most recognizable landmark and among the chief Gothic buildings in Europe. 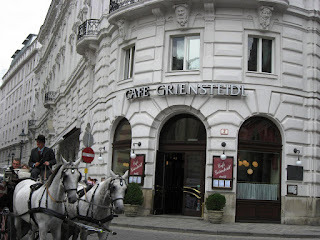 Horse-drawn carriages and costumed ticket-sellers gave this place an old-world charm. The cathedral looks black and charred; it has indeed been in perpetual re-construction as it survived invasions and fire through the years. 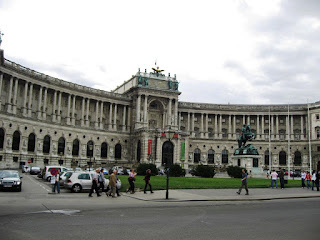 I continued walking and found myself in front of the Hofburg Imperial Palace. 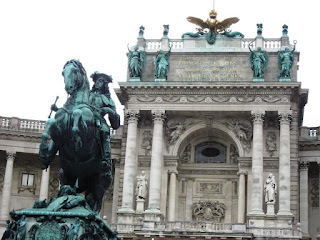 This massive palace complex was the chief residence of the royal family for many years until the monarchy ended with World War I. Incidentally, after the union of Austria and Nazi Germany in 1938, Hitler addressed a large gathering from a balcony of this Palace. 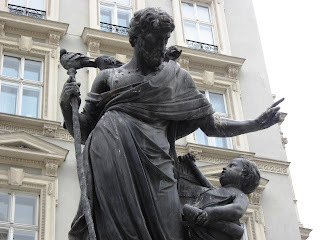 He knew this city well, having spent some of his formative years here. 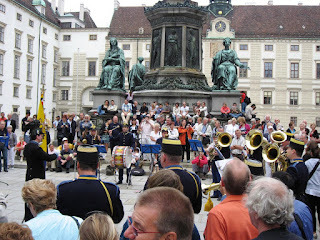 It was very evident that Vienna is the Mecca of western classical music. 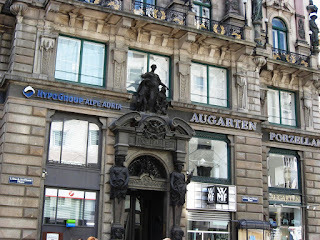 Mozart, Schubert, Strauss, and Brahms: they hailed from Austria and composed their music in this city. 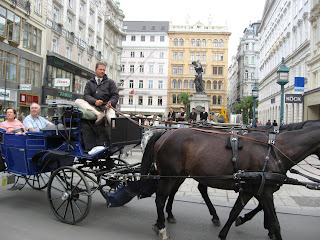 Even Beethoven, wanting to study with Mozart, moved to Vienna and lived there until his death. 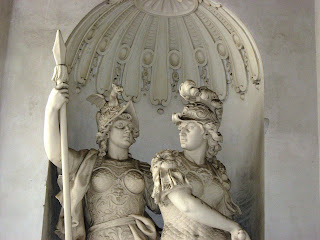 There are numerous monuments and operas that bring to life their genius once again. By now I was tired; this had been a rather long walk. On my way back to the hotel, I ran into a person who wanted directions. He claimed to be a Slovak. Even before I could reply, another guy comes up claiming to be a cop and asks for identification. The Slovak showed him an ID and walked away. I didn’t have my passport with me, and so he wanted to check out my credit cards. When he asked me for the PIN, I began to suspect there was something wrong. Thankfully, when I refused to part with the PIN, he quickly walked away! 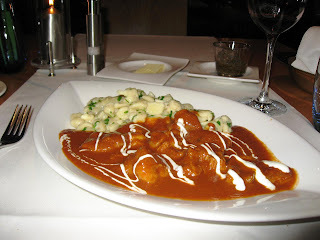 For dinner, I ordered a traditional Viennese Veal Goulash with small buttered dumplings and green salad on the side. 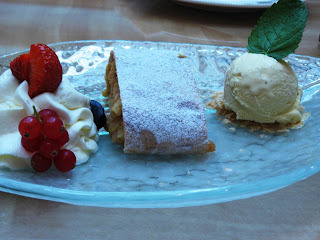 I also tried the famous Wiener Apple Strudel served with a dollop of whipped cream and a scoop of ice-cream. Absolutely delicious stuff! Sounds fantastic. Also sounds like you need to keep both hands on your wallet at all times. @sank: That was an interesting experience. Unexpected because crime rate here is very low. Excellent photograps and description of the charming place. @harekrishnaji: Thank you for being a regular here. shantanu - you should be the CNBC travel correspondent! @harekrishnaji: I haven't seen it myself, since I have been outside of the country. @deepti: Thank you. That's what I like most about Europe. You should have said your PIN number is four stars (****)..haha! @indicaspecies: Thankfully, I can laugh at it now! And thanks.